This is my third attempt to post something on our blog. I usually get interrupted and save what I’ve been working on to complete at a more opportune time. At least I think I’ve saved it. I can never find it again, so I’m obviously doing something wrong. I think this is a lesson in persistence. I’m confident that, by the time we’ve finished our mission, I will be quite proficient at blogging. Let’s see if I can finish this without having to save it. You’ll have to wade through it as it covers three weeks instead of just one. We arrived at the Missionary Training Center (MTC) an hour later than expected as our flight was placed in a holding pattern for an hour before landing in Salt Lake due to foggy weather and heavy traffic. We received a warm welcome and were informed we would be staying at the Provo Marriott Hotel as the MTC was overcrowded. We have a lovely, comfortable room which we have thoroughly enjoyed. There is a pool, which we haven’t used as we didn’t bring any swim suits with us, and a fitness room, which I have made regular use of. The first week we had the “Preach My Gospel” training, which was very intense. We did lots of role playing, which took us completely out of our comfort zone. But it was a great learning experience. We were promised if we would treat each role play seriously, with a sincere desire to learn and to teach, we would be led by the Spirit to know what needed to be said. It was amazing to us to experience exactly that. We soon were able to identify and follow the promptings we received. It was a very rewarding and enlightening week. The second week we received training on the Perpetual Education Fund (PEF). We learned that there is a lot more to the PEF than most people understand. It is truly an inspired program. On Tue and Wed. our classes were at the MTC. But on Mon., Thurs., and Fri. we went to the Church office building in Salt Lake City. 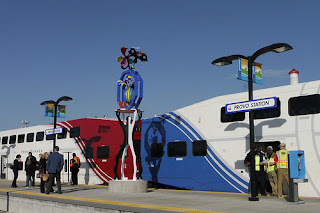 We travelled on the new double decker train, the Frontrunner, which left the Provo station at 6:57 am. That meant we would leave the hotel in a shuttle at 6:30 to make the connection. The train took one hour, and then we transferred to a bus that dropped us right in front of the door. Our friends, the Learys, went with us, as this was the only course they hadn’t taken before we arrived. We quite enjoyed the trip, though not the early hour. By the time we took the bus, train and shuttle back to the MTC it was 6:20 in the evening and they stopped serving in the cafeteria at 6:30. Once we were in we could stay as long as we liked though. We would then take a shuttle back to the hotel and arrive around 7:30. It was an exhausting week but well worth the effort. We were supposed to have left for India on the 10th of Feb. but as our visas hadn’t arrived our departure was postponed. So we decided to sign up for the Family History course this past week. It only runs once a month so we were grateful to find that it happened to be a week that we could take advantage of. The course is in Orem and the MTC shuttle doesn’t go outside of Provo, even though you can’t tell where one city ends and the other begins. Thankfully, one of the volunteers who help with the classes lives in Provo and offered to pick us up each morning, so we didn’t have to bus it. We were taught how to find our ancestors and create a family tree as well as how to research their history so we can get to know them more personally. And of course, how to prepare their names for the temple so they will have the opportunity to receive the ordinances of the gospel. Since all of this requires some skill on the computer, you can imagine how much of what I was taught I really know. I’m trusting that as I start using it I will remember. Besides, the notes and exercises they gave us are very comprehensive and I plan to use them. Well, the end of the week has come and gone and we still have not received our visas. Apparently they aren’t expected to be approved for another couple of month. The Learys are in the same boat. The Missionary department, with the approval of the Quorum of the Twelve, have decided to temporarily reassign us to Canada while we await the arrival of our visas. The Learys will go to the Winnipeg mission and serve in Regina, Saskatchewan. We will go to the Montreal mission and serve in Val-d’or, Quebec (not Ottawa as we had first thought). Google Streetview of the church meetingplace in Val-d'or, Quebec. You can see the two brown signs for the church over the doorway. When we first heard about being reassigned to Canada we were a little disappointed. But once we read the email confirming where we were going we became excited. 3/5 of the people speak French and 2/5 speak English. When a talk is given in English they have a French translator and when it’s in French they have an English translator. There are only about 20 active members up there but the Elders have 8 baptisms scheduled. They have been requesting senior missionaries for a long time. They’re sending us up there (6 or 7 hours north of Montreal) as a pilot project to see if we can make a difference. We will need a car as the town isn’t very big so there is no bus service. Our flight leaves on Wednesday morning [Feb 20] at 7 am. A shuttle will pick us up at the hotel at 4 am and take us to the MTC to join other departing missionaries. We have become accustomed to getting up between 5 and 5:45 every morning, but 3 is going to be a challenge. We have found our experience here to be beyond our expectations. We have been pushed both physically and spiritually and have discovered we are capable of much more than we had realized. We will miss the wonderful people at the MTC. Everyone is trying to be their best self and to become even better. There are smiling faces everywhere and always someone to lend a hand if you need it. It's a marvelous place to be. There is one problem here, though, and that's the food. There's too much of it and it's too good! Everyone gains weight before they leave. The longer you’re here, the more weight you gain. As much as I have enjoyed not having to cook or clean, it will be nice to have more control over what we eat, as we obviously don’t have much self-control over what we choose. Oh dear,I'm being called for supper so I'd better say goodbye. Update: by email Feb 22. 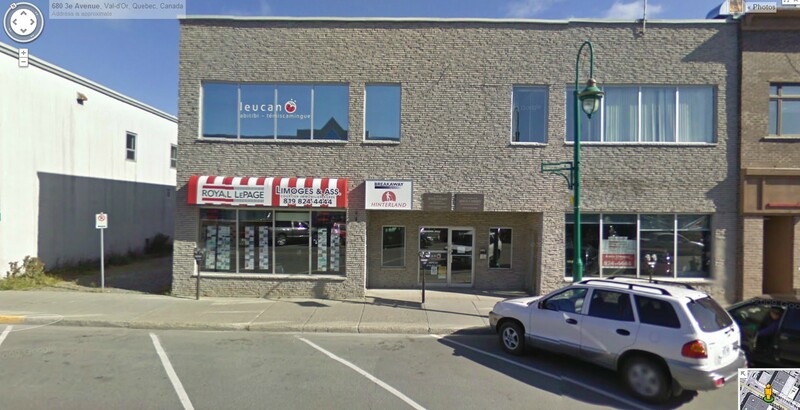 We're leaving for Ottawa tomorrow to meet with our Branch President. 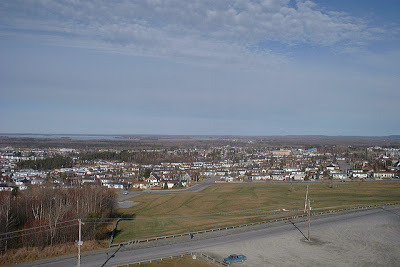 I know we'll have more time to learn to blog once we get settled in Val d'or. We are still too busy with schedules and committments to do much now. Yesterday we spent the whole day, from 8 am to 7:30 pm either out with the mission president and his wife apartment hunting or purchasing, registering and insuring a vehicle. Today we were in training meetings from 9 to 1, then lunch and then back to the mission office to pick up our phone. From there we went to get a few things for the van and our trip and then shopped at the "CMM Free Thrift Store" to try to get a few winter clothes and boots before we go to a regular store. Getting around Montreal is every bit as difficult as I had heard it would be. You're putting your life at risk every time you get out on a street! I'm glad we'll be in a small city. Note from Sheri: Dad's comment about Val-d'or was "They have a Wal-mart!" His grandson is serving in Guatemala and was just sent to a new area and made the same comment in his letter home. The Mission President and his wife that they spent the day with are pictured here. 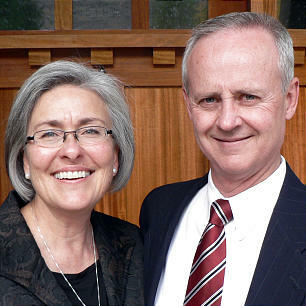 They were called in 2010 and the new mission president for the Canada Montreal mission was just announced as Victor P. Patrick but he won't begin his service until July 2013. We are finally settled as to what is going to take place. We are a little unsure of what is indicated by the word "French" in front of our MLS (member, leader support) assignment. It would be nice to learn French, but if we are only going to be there for a short time, I think I will opt to be in an English speaking location. We may have to beef up our cold weather clothing. It is still our hope that India will be not far down the calendar. We really are looking forward to having a chance to spend time in our temporary location. We think that Ottawa will be a possibility. We are keeping very busy and each day leaves very little time for washing clothes, shopping, personal study or anything else. The alarm doesn't like me. It keeps making noises at 5:15 AM or 5:45 on a good day. We realize everyone's been waiting for us to post how we're doing here at the MTC. Every day I've planned to fill you in and every day we've been too busy. Last week I actually wrote on the blog but somehow I lost everything before I got it posted. I'm at the kindergarten level when it comes to blogs. I only have a few minutes right now as Scott is coming to get us for supper soon. But I figured a little is probably better than nothing. We are thoroughly enjoying the MTC. The Spirit there is wonderful. The people are wonderful. The growth we're experiencing is wonderful. Everyone has the same purpose, to learn to share the good news of the gospel. Everyone is trying to learn to live to be worthy of the inspiration of the Holy Ghost. We are all of one mind, with one purpose. I often think this must be what it felt like to live in the city of Enoch.